The large grizzly bear model comes from The Foundry. It's one of the few Foundry minis I own. It comes from pack, GPR19, Belicose Bears. They are really great sculpts—most of the Foundry's stuff are. They're just ridiculously expensive! 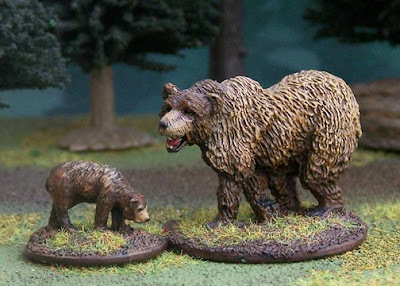 Mega Miniatures also sells a bear set: a male, female and cub. I bought them last winter and was disappointed at how small they were. I'd say those Mega Mini bears would fit better with true 25mm models, rather than my 28mm guys. The cub, however, is perfectly suitable for use with this Foundry griz. Bear Attacks: Their Causes and Avoidance , by Stephen Herrero. I learned of this book after reading Bill Bryson's A Walk in the Woods. One thing I have always thought, as far as animal miniatures go, is that you can always excuse variation in size as differences in age, breed, or general health. True! I bought some 1/72 cows (part of an Imex Pilgrims set). They are kind of big for 1/72, but will make great young cows for 28mm.